A older star the still glows brightly. The mass and size of the star has lead to a system slightly smaller then that of Sol. Status as a K-Class it is able to host a handful of planets capable of supporting life. A dead world lacking an atmosphere due to it's close proximity to Tau Ceti. Constant bombardment of solar radiation and a slow rotational period have otherwise left the planet in a highly undesirable state. As such very little effort has gone into any sort of planetary study, outside of sparing expeditions on the dark side of the planet and orbital scans which reveal very little for mining content. Home away from home, A nice blue planet snug in the goldilocks zone with native live and a booming economy. A still growing amount of fluff on this nice little rock can be found here. An absolutely massive orbital spacedock located in GeoSync orbit around Binma. The Scaffold serves as the relay between Binma itself, Between Binma and New Gibson, And effectivley the rest of Tau Ceti. Though not the only spacedock it's certainly the largest in system, And holds all sorts of amenities including hotels, Restaurants, And lots and lots and LOTS of ships coming and going. A moon approximate 1/6 The size of Binma. A lightly blue with some interesting geological formations thanks to years of soaking in impacts. Site of many prospects for Helium-3 harvesting in addition to just looking pretty. A brown moon 1/10 the size of Binma, Brownish in color with strange patterns similar looks to Ganymede. Very little notable features outside of that. A moon of "New Gibson" Approximately 1/8 The planets size, Notable interesting for it's rather diverse material makeup and an interesting amount of seismic activity. Despite this it lacks anything that could be called a significant atmosphere and is largely considered unsuitable by normal means. A captured asteroid approximately 2/8 the size of "New Gibson." Notable for pockets of crystaline formations deeper inside, Making archaeologists believe it was once a part of a larger forming planet. Aside from that, Used for Helium-3 gathering. A very small lunar body approximately 1/10 the size of "New Gibson." A very low gravitational field and a rather lackluster surface made this orbital body the last to be fully explored. Still, A minor surface base and Helium-3 gathering elements exist on this tiny rock. A super earth like planet that exists far outside the Goldilocks zone as the fourth orbiting body in the System. The planet holds a grueling 3.9 measurement in G-forces, A large collection of Methane oceans, And a very dense atmosphere with a high content of Sulfur Dioxide. Despite this the planet has been eagerly plotted for multiple assisted human and robotic mining operations thanks to an incredibly dense amount of heavy metals from simple surface prospects. Additionally, The planet also holds a collection of extremophiles which seemingly have thrived in the hostile conditions of the planet, Placing an additional scientific interest on the planet as well. Two orbital facilities that serve as staging points for exploitation of Lemnos' dense mineral deposits. Each facility comes with moderate accommodations for individuals who work on and near the planet, But there is very little distinction between the two facilities aside from who is contracted there at the time. Deep Space Telescopes discover Lemnos and New Gibson in 2056. Previous system makeup is questioned. Binma is discovered in 2108. Telescopes unable to define planetary features. 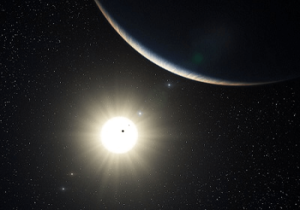 Observation probes enter Tau Ceti in 2124. Tempestus, Halycon, and Peabody discovered that same year. Providence deep space probe take the first high resolution photos of Binma. Binma officially classified as a Garden world in 2180. Mehet discovered the same year. Tau Ceti colonization begins in 2183. Binma becomes the first planet to be colonized in system. New Gibson colonized in 2234. Planet surveys discover huge deposits of mineables. Binma's government spearheads in-system development. First Orbital Spaceport placed in Binma Orbit. This page was last edited on 6 February 2019, at 21:49.